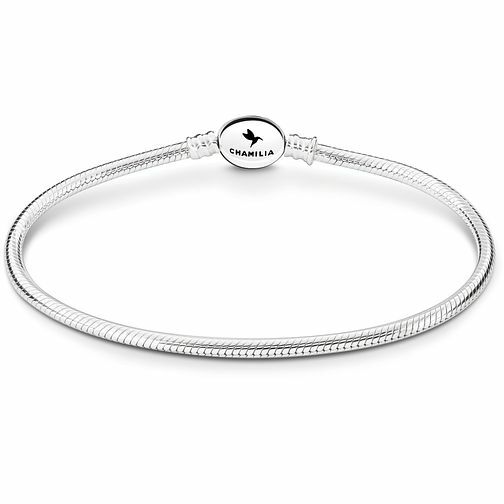 From Chamilia, this delicate bangle is crafted in shining sterling silver and features textured detailing for a contemporary finish. Adorn with your favourite Chamilia bead to create your Chamilia collection. Discover all the ways to express yourself with one of a kind jewellery that reflects your life and experience. Chamilia Sterling Silver Oval Snap Bracelet 7.1 Inch is rated 4.0 out of 5 by 2. Rated 4 out of 5 by Anonymous from Good size Good strong clasp. due to the nature of the 'chain' it does catch the small hairs on my wrist, don't know if anyone has mentioned that before, so can't wear it for long periods. Rated 4 out of 5 by Anonymous from Good Overall Product Lovely just what was required recipient was very happy.